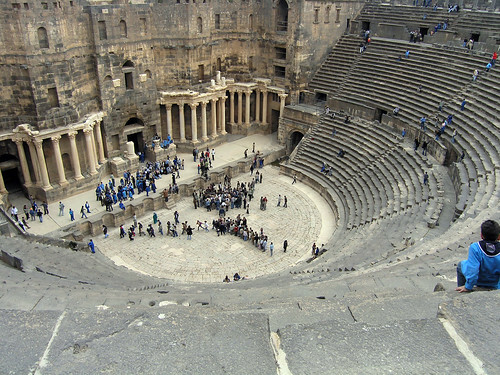 second century AD roman theatre in bosra. the stage and seating was gradually filled with sand over the centuries which contributed immensely to the state of preservation. back in copenhagen, I found an old german etching of the place in which only the top 6 rows of seats are visible. the theatre was only dug out in the 20th century and it is not yet as famous as it should be. as shown above, all the other guests there were syrian school children. they tour the sights of their own country and they were always great fun to meet even if their english was limited to "whatsyourname?". the columns, centre-left, are reconstructions and don't stand up to closer inspection. I believe we ran into some of the originals in the mosque of umar (a few pictures down from this one) - the real second century columns and capitals you see here in southern syria are exquisite. more from our trip to syria.